Habit: Plant +- glabrous. Stem: 1, decumbent or ascending, base often spongy-thickened, 1.5--5 dm. Leaf: stipules scarious; leaflets 5--7, +- opposite, 1--2.5 cm, elliptic or obovate. Inflorescence: 4--10-flowered; peduncle bract 0 or just below umbel, generally simple. Flower: calyx 5--7 mm, lobes < tube; corolla 10--13 mm, banner bent or recurved 90--180°, yellow, other petals white, claw +- exserted from calyx tube. Fruit: 3--5 cm, 1.5--2.5 mm wide, linear, glabrous. Seed: few. Synonyms: Lotus pinnatus Hook. ; Hosackia bicolor Benth. 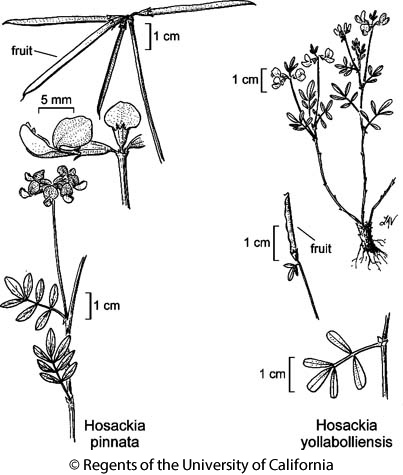 Citation for this treatment: Luc Brouillet 2012, Hosackia pinnata, in Jepson Flora Project (eds.) Jepson eFlora, http://ucjeps.berkeley.edu/eflora/eflora_display.php?tid=28458, accessed on April 22, 2019. KR, NCoR, CaR, n SN, c SNH, CCo; Markers link to CCH specimen records. Yellow markers indicate records that may provide evidence for eFlora range revision or may have georeferencing or identification issues. Purple markers indicate specimens collected from a garden, greenhouse, or other non-wild location.